Isn’t it funny how trends come and go? I was thinking about metallic trends. When my parents got married almost 51 years ago they chose white gold (silver looking) rings. Twenty-five years ago all there was for ring choices for our engagement was gold. The trend goes back and forth between warm and cool metallics, so today I’m doing some warm, with a touch of gold. 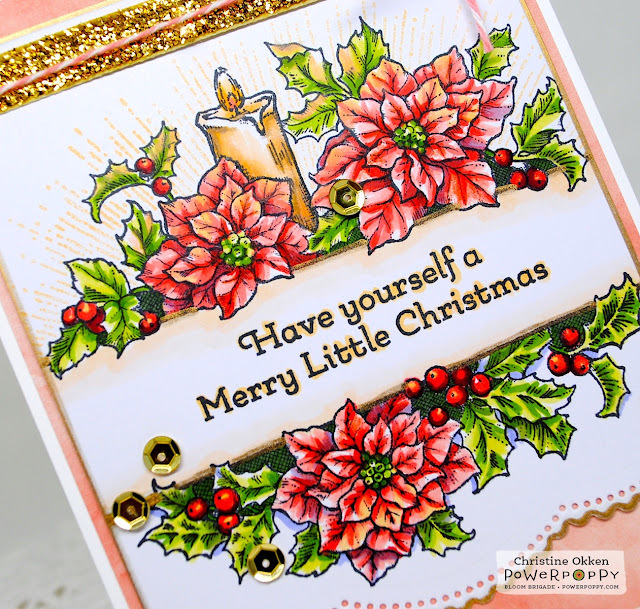 I enjoy non-traditional colours for Christmas cards as much as the traditional red and green, so I’ve coloured up some peach poinsettias from Power Poppy’s Let Your Heart Be Light stamp set, paired with golden candlelight. This a gorgeous set that you can mix and match to create the look you want. I’ve used both the upper and lower bough stamps, the candle “glow”, and the sentiment image in-between. I stamped off the golden glow stamp once before lining it up over the top of the image so you get a softer look. You can see I’ve added some golden glow to the poinsettias and holly leaves where they surround the candle, and I’ve edged my lines with a Krylon Gold Metallic Pen, including the scalloped border. Check out the beautiful Good Vibe Friday inspiration at the Power Poppy Blog! Beautiful colors and coloring in your lovely card! 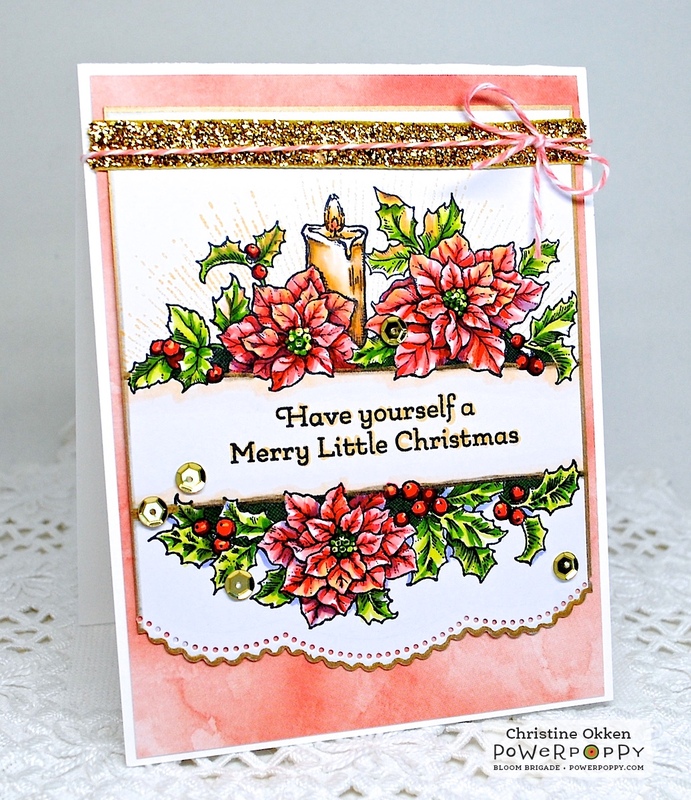 Christine, this is as exquisitely beautiful as your coloring and cards always are! Yes, it's funny about trends. Rich and I chose plain white gold bands when we got married. Simple. Christine, this is just gorgeous! I love your colored poinsettia and candlelight with gold trim. Warm gold would be a favorite of mine. May I ask what die set was used for the scalloped border along the bottom? That is so feminine and one I would love to purchase. 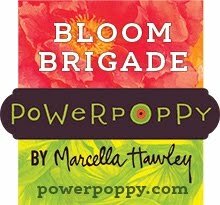 Thank you for sharing these lovely Power Poppy stamps! !